If you are sending us any of the following material, including pictures, documents, text, your email, that contain any well known fake and fraudulent terminology or invitation or incentive to criminal actions (smuggling) or any clues to violation of any rules, laws or policies of any country, or laws on prevention of money laundering and terrorism, or usage of fake terminology such as "Aurum Utallum" or "Aurum Utalium", or any pictures of clearly fake gold such as pictures of fake "gold nuggets" (all the same to each other, made from brass), or any of your pictures in such dealings, or pictures of your friends, or any photography, PDF, or any other kind of documents, containing the terminology F.C.O. "Full Corporate Offer" or better Fake Corporate Offer, or Aurum Utalum or Utallium or Utalium, the non-existent word, or invitations to buy gold by naive, not logical and idiotic manner, you are giving to our company GOLDIVANTI LP the rights to use such documents, including any emails, on our website and other websites and to publish them and expose them to other parties. By submitting Content to Operator for inclusion on our Website, you grant Operator a world-wide, royalty-free, and non-exclusive license to reproduce, modify, adapt and publish the Content. By submitting Content to Operator for inclusion on our Website, you grant all readers the right to use, re-use, modify and/or re-distribute the Content under the terms of the Creative Commons Attribution 4.0. with attribution to your name. For reasons of privacy, you are granting us the right to hide your name and address, until you request us to publish your name. When you receive the email from General Partner, telling you that all information that you send is private information, and confidential, such information will not be subject to the website's Terms of Service and will not be published on the website. The Bitcoin Affiliate Program for Goldivanti® Investment Gold pays 1 BTC or 1 Bitcoin per month to the affiliate partner for the each month of the delivery time. The expected delivery time is 6 months, thus for each month the affiliate partner is to receieve 1 Bitcoin, paid monthly. Affiliate partners need to apply individually by contacting our company GOLDIVANTI LP. Goldivanti® Prepaid Gold Forward Sales Contract for Bitcoin is the sale of Goldivanti® Investment Gold with the discount of 20% for 1 kilogram and 30% for 2 kilograms of gold. The gold is mined directly on mining sites in Tanzania where our company have investment interests and mineral rights. 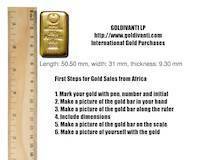 First steps to be provided for all purchases and gold trade offers from Africa is to provide us with pictures of your gold, together with you, in certain order, for each gold bar, 3 pictures. Follow the steps to successful gold trade deals. Gold refining terms and conditions for Goldivanti® Gold Refinery represents the entire understanding and constitutes the whole agreement in relation to its subject matter and supersedes any previous agreement between us with respect to the same in regards to gold refining services.